One of the best bed & breakfasts you will find anywhere, it just so happens to be located in one of the most naturally beautiful locations on the planet… Two superb luxury holiday homes available for rent also. 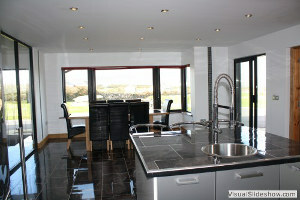 Both the B&B and the holiday homes are available year-round. Three Star Bed & Breakfast, Luxury Holiday Homes, set against stunning backdrops of the Atlantic and Mount Brandon, the Old Pier on the Dingle Peninsula has it all. Look no further if luxury self-catering accommodation in a holiday home enjoying the beauty of the Dingle peninsula is what you seek. 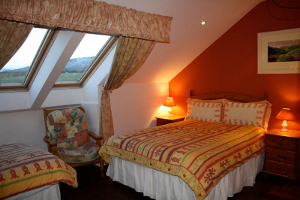 Should the comfort of three star Dingle bed and breakfast accommodation enjoying panoramic ocean views be what you are looking for, you’ve found it. Gaeltacht area, where Irish is our first language, “Tá fáilte is fiche romhaibh go léir!”, which means a warm welcome is offered to all. 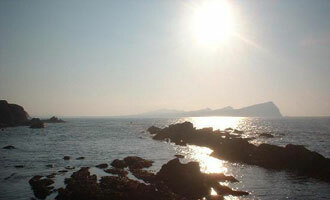 The Old Pier B&B is perfectly located for Hikers and Walkers of the Dingle Way. 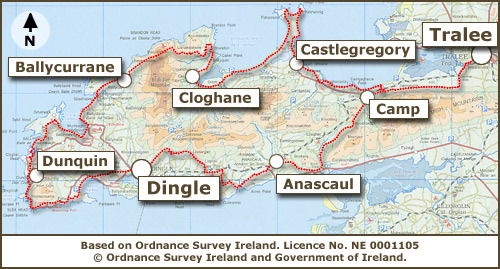 Click here for more infomation about the Dingle Way. With breathtaking panoramic views of the sun setting, the Old Pier is the perfect romantic location to end your day touring the Dingle Peninsula. Each morning, guests choose a hearty breakfast from our traditional Irish, Continental and Vegetarian options. The National Geographic Traveler described Dingle as “the most beautiful place on earth” and in this idyllic spot the Old Pier enjoys a superb location at the edge of the water with magnificent views of the Atlantic Ocean and Smerwick Harbour, less than 15 minutes drive to the heart of Dingle Town, near Ballydavid, Dingle, Co. Kerry.